It doesn’t come as a surprise for many to hear that too much salt is bad for you—cutting down on sodium is something doctors and nutritionists have been pushing for years. 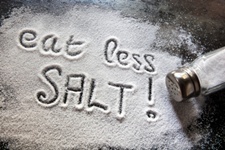 However, a new Japanese study has shown that not only habitually high-salt diets, but even a gradual increase in salt consumption can increase the risk of developing higher blood pressure. After three years, almost 23% of the participants ended up developing high blood pressure. Researchers found that those individuals who consumed the most salt (up to 5,644 mg a day) were the ones who were most likely to end up with high blood pressure by the time the study ended. Moreover, participants who gradually ate more sodium also ended up having high blood pressure. According to the study’s lead author, it made no difference if their blood pressure was high to start with or increased gradually over the three years—both of the groups had an increased risk of ending up with high blood pressure. These findings, which were published in the Journal of the American Heart Association, stress the importance of monitoring salt intake not just now, but over the course of a lifetime in order to properly manage blood pressure levels and maintain hearth health in the long run. High blood pressure is one of the major risk factors for strokes, heart attacks and heart failure. Takase, H., et al., “Dietary Sodium Consumption Predicts Future Blood Pressure and Incident Hypertension in the Japanese Normotensive General Population,” Journal of the American Heart Association 2015; doi: 10.1161/JAHA.115.001959. “The result of eating too much salt can be measured in blood pressure,” American Heart Association web site, July 29, 2015; http://newsroom.heart.org/news/the-result-of-eating-too-much-salt-can-be-measured-in-blood-pressure.